As a warning, this is going to be a very rambly review that’s mainly me talking about my future and life experiences. So, if that sounds utterly tedious to you, just go ahead and stop reading now! That’s not a quote from the book. That’s a quote from my great-grandmother, Gram. (Technically her name was Loretta, but I knew her as Gram.) I wish I knew her better, honestly. I never really knew her at all. I can count on one hand the times I saw her in my memory. The first two times were when she came out to our house after we moved, so when I was nearly 5. Just to see us. Check on us. See how we were doing. The first, it was all fine. The second, my parents noticed changes in her. Shaky hands. One of her pinky fingers couldn’t straighten at all. She could have fallen down our stairs. And we have a ton of stairs in our house. The third time was probably around her 90th birthday so I could have been around 7-8. I don’t quite remember. All I remember is that there were tons of people there and I only knew a few people and my uncle’s girlfriend (now wife) kept talking to me. The fourth time, it was when she was in a nursing home. And I remember the elderly people around who didn’t look great. I remembered how it smelled funny. I remembered how delighted my Gram was to see me, her one and only great-grandchild. She went to a nursing home because she had two mini-strokes that really debilitated her. And her son, my granddaddy, decided to take these matters into his own hands. Her husband died a little bit before I was born, so she had been alone for a very long time. And she was lonely in a big house. My granddaddy lived in the DC area while she lived up in Pennsylvania. Not easy to get to her if something happened. So, he sold her house and sent her to a nursing home, a place she didn’t want to go to at all. Then, when I was 15, she passed away at 98. And I didn’t go to her funeral — too far away and finals were going on. And I don’t really remember her. But she said those words to my grandmother about how tough aging is. She lost all her teeth and had dentures. She had developed Parkinson’s. She couldn’t walk anymore. But, in her words, she wasn’t a sissy. This book is a testament to that. It’s not easy. It’s not glamorous. It’s one of the hardest things you can do and you kind of have to do it. There’s no way to escape it, no matter what medicine has done to stave it all off. 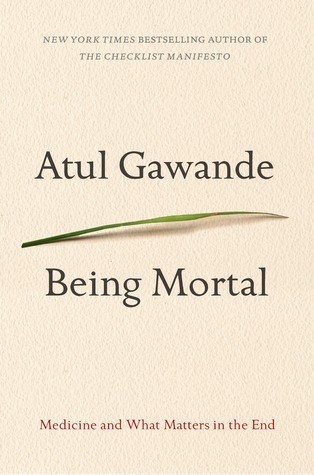 Atul Gawande’s whole premise for this book is to make a point of saying that modern medicine has failed us because it fails to understand that there are times when you have to let go, to stop trying, and to find out what matters most to you when the end is coming. Gawande’s message is simple but revolutionary when you consider all these aggressive methods of fighting off illnesses, some of which shorten your life and make it worse. While I was reading this book, I looked at it from a very different angle than most might. I plan on working as a geriatric social worker. My first practicum (aka field education) is going to be with a local hospice. And this book gave me so many tips on how to handle situations I might find myself in, the way to phrase things you want to ask, how to make the person you’re with comfortable. It gave so many great ways to battle against the system of “fix it, fix it, fix it” when there are no fixes. And how to come to that person saying that and finding out how they want to live their last days. It gives tips for family members making these choices, for clinicians to approach people, and for people starting to wonder about these things. I highly recommend this book to everyone. Because we’re all going to face this time, even if we don’t want to. And we’re going to have to realize just how difficult it is. Does this book sound good to you? Would you check it out? What do you think about the message it has? I don’t often read non fiction books, but this one sounds amazing!! And you’re right, it’s something people don’t want to think about, but it’s inevitable. Your grandmother seemed pretty cool, I love the quote she said! If you read it, I hope you enjoy it! Er. Well. I hope that you can get something meaningful out of it. It’s a tough book but very enjoyable. And, my Gram was a fiery woman. She was pure Italian and the stereotypical one at that.